Inside the triangular wooden palisade of the re-created 1610-14 fort are wattle-and-daub structures topped with thatch roofs depicting dwellings, as well as an Anglican church, a court of guard, a storehouse, a cape merchant’s office and a governor’s house. Historical interpreters forge and repair metal objects in a blacksmith’s forge and show how matchlock muskets are fired. 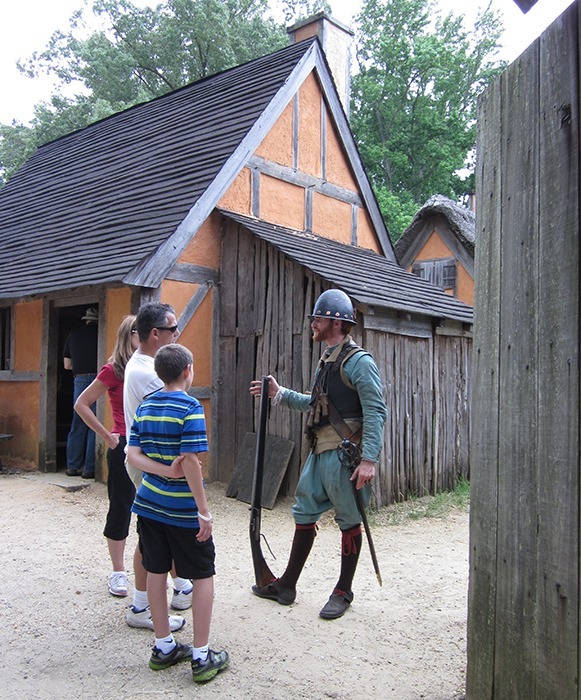 Seasonally and periodically, interpreters also produce wood and leather products using 17th-century-style tools, engage in domestic activities such as sewing and meal preparation and, outside the fort, cultivate food and tobacco crops. Try on armor and play games of quoits (ring-toss) and ninepins (bowling). Watch a video about the mechanics of 17th- and 18th-century muskets. Historical interpreters present daily matchlock musket demonstrations in the fort.